This french sofa will bring class and comfort to any space. It features lovely sloping rolled arms, cozy cushions, and tapered wood legs. 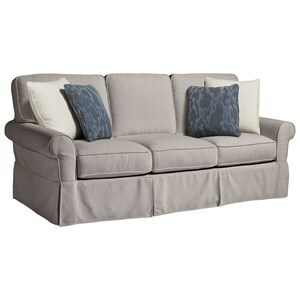 The Molly Transitional French Sofa with Sloping Rolled Arms by Bauhaus at Reeds Furniture in the Los Angeles, Thousand Oaks, Simi Valley, Agoura Hills, Woodland Hills, California area. Product availability may vary. Contact us for the most current availability on this product.